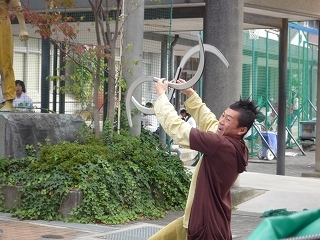 His familiar pantomime "Charlie Yamamoto" is upgraded every year and new performance "Ashika-chan" is debuting in Shizuoka. He said, "Here in Shizuoka, I always try to show the new entertainment. Because I can get an immediate audience reaction in Shizuoka. 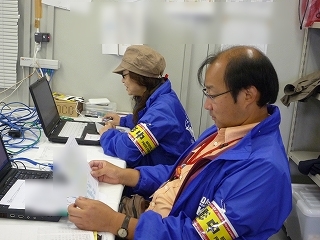 If Shizuoka people did not like it, it's would be not good everywhere in Japan." In his career, he joined Rakugo club in the high-school and did acting and then got to learn pantomime in the USA. 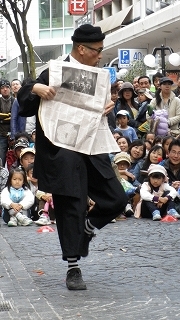 In recent years, he works as an actor, for example, he appeared on stage of an opera. 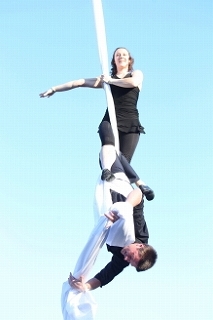 A couple, Vicki from England and Wibbe from Netherlands performs an acrobatic show. They use a 10 meter white cloth and a just ordinary chair (bought in IKEA). They climb the white cloth high up and wind it on their legs or arms. Their show is a romantic love story in the air wih a gracefull piano sound. 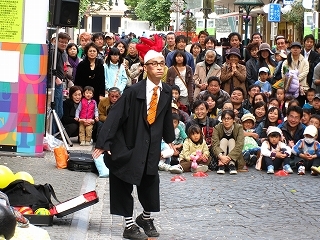 They say they want to show not only acrobatic performance but also a performing art to audience. YES, IT IS THE ART. That is a beautifull art in an open-air theater. 20 years ago were captured on the screen last night. not to be asked to use his photos. He claimed that he has much rarer ones! He has been taking photos of Daidogei for 23 years. He even informs you some additional old story. which Daidogei fans would be eager to see. Who is going to be taken a photo by him? He is looking for a target and that might be you!? takes us to a nongravity world! and the silver hoops seem gravityless. words like "creepy" is the best praise for him. it starts to spin around as if they are living. "I want to perform without throwing things," he said. He is may be a nongravity magician.